WASHINGTON — Nearly three-fourths of Americans think the United States should have diplomatic ties with Cuba, but they’re not sure how far to go in lifting sanctions, according to an Associated Press-GfK poll released Monday as full diplomatic relations between the two countries were formally restored. The resumption of normal ties ended decades of acrimony between the two nations that was hardened when President John F. Kennedy and Cuba’s Fidel Castro fought over Soviet expansion in the Americas. 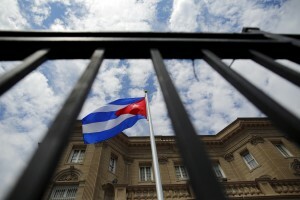 The new diplomatic status, however, does not erase lingering disputes, such as mutual claims for economic reparations, Havana’s desire to end a more than 50-year-old trade embargo and the U.S. push for Cuba to improve human rights and democracy. The new poll also found that 58 percent of Americans approve of President Barack Obama’s handling of the U.S. relationship with Havana while 40 disapprove. By contrast, only 39 percent approve of his handling of the U.S. role in world affairs more generally, while 59 percent disapprove. Respondents were split on what to do about the sanctions on Cuba. Forty-eight percent thought they should be decreased or eliminated entirely while 47 percent favored keeping them at their current level or increasing them. Five percent didn’t answer. The story was different when it came to Iran. Seventy-seven percent said they thought sanctions on Tehran should be kept where they are or increased, according to the poll, which was conducted just days before the U.S. signed an agreement to curb Iran’s nuclear program in exchange for economic sanctions relief. Under the agreement, Iran’s nuclear program will be curbed for a decade in exchange for potentially hundreds of billions of dollars’ worth of relief from international sanctions. Mary Barry, 57, of Arlington, Texas, is happy that the Obama administration opened diplomatic efforts with both Cuba and Iran, but is wary about lifting sanctions on the two countries. On Cuba, she thinks it’s “just time” to restore diplomatic relations. But she favors a gradual lifting of sanctions on Cuba. “I don’t think they should be lifted immediately,” she said. There is some momentum in Congress, however, to lift the trade embargo. Sen. Amy Klobuchar, D-Minn., backs a bipartisan bill in the Senate to lift the embargo, which she said must be done for the U.S. to avoid losing investment opportunities that will come with loosening of travel restrictions to the island. “Once millions of American tourists are going, they will need places to stay and they will need food to eat. … So when they come, they are going to be starting to sleep in Spanish hotels and eat German foods because those countries will be able to supply what they need in the tourism industry, not to mention the computers and Wi-Fi and everything else,” Klobuchar said in an interview. She predicted the legislation, which has 20 co-sponsors so far, would pass, although maybe not this year. “I know there are some people who have long been opposed to this,” she said. The AP-GfK Poll of 1,004 adults was conducted online July 9 to July 13, using a sample drawn from GfK’s probability-based KnowledgePanel, which is designed to be representative of the U.S. population. The margin of sampling error for all respondents is plus or minus 3.4 percentage points. Respondents were first selected randomly using phone or mail survey methods, and later interviewed online. People selected for KnowledgePanel who didn’t otherwise have access to the Internet were provided access at no cost to them.